Transition bras: nursing only or a post op option? I haven’t posted in a while now, partially because my time has been filled with all things baby, but also partially because there is not much to share. Until recently! Now I’ve got some more great bra things to share, and hopefully some progress on breastfeeding, insufficient glandular tissue, and implants. Most of my focus has been on breastfeeding. It’s normally a challenge, but add in low supply due to IGT and it becomes more of challenge, to the point of being a daily obsession. Before Gabrielle was born I was worried about what size I would need after milk came in. I didn’t want to buy too much, or really anything. In the same way we only bought 3 bottles, I didn’t want to buy tons of nursing bras when I wasn’t sure how it would work out. 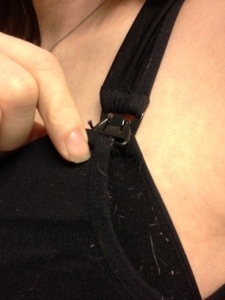 A little searching and I found what is called a transition nursing bra. 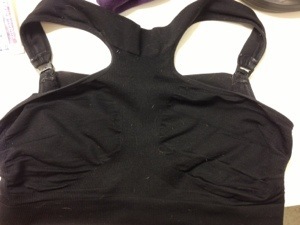 It’s a super stretchy material similar to that of the Ahh bra or Genie bra. The point of a transition bra is to stretch with your as your breasts change during the early stages of breastfeeding. Sounds pretty perfect? Well it’s, not. But it is useful and it could be useful during the early post op period from a breast surgery. Meet the Shaparee Seamless Pullover Nursing Bra. It’s a basic sport style bra with tons of stretch. It has a high neck for size increases, wide straps, and a racer back. Please ignore the wear & tear, and the dog hair. I’ve been using the heck out of this bra. Partially because its comfortable (if not very supportive, hence the not perfect), partially because I haven’t ordered new bras and added nursing clasps yet. Looking at it, it looks like a basic sports bra. It has light compression when first worn, perfect for the early post op period. It is very stretchy, you can bring it up over your feet if needed. The straps are wide, but not very strong so while they don’t dig they do absolutely nothing for the small amount of support they should provide. The clasp is a normal nursing clasp. I’ve pulled it to the side so you can see the internal sling that joins the cup to the band. I like the wide but stretchy construction of this for the early post op period. It is good because it provides support to the sides if you get the feeling like your new implant is going to fall into your armpit. This feeling goes away as you get used to he new implant, but it can be disconcerting. It is not restricting, it will stretch as you have some swelling. Unlike a normal nursing bra which usually has a side sling with little stretch. So while we all hesitate to grab a “mom bra” for our post op period, this is a type of bra that you really should consider. Many women compare the feeling of engorgement to how their new breasts feel during the post op period. Don’t think of your post op options in terms of a nursing bra, sports bra, or whatever. Think of them in terms of comfort, wearability, and practicality. After all, it is just a bra to transition you through the healing process. Posted in: Breast Implants After Baby ♦ Pregnancy with implants ♦ Under wear?? This does seem more like a post-op bra than a nursing bra- it does seem great as a post-op option. I’ve never had kids, but I imagine when I do I’m going to need more support than this while nursing in order to be comfortable going anywhere! Although as a house bra during that time it does have a lot of appeal. It’s definitely a “house” bra. There is nothing to hide your nursing pad, they show right through. It’s really great for the early days post delivery while you wait for your milk to come in and you have initial changes to your underbust. In those first few days after delivery I lost 2″ from my underbust. It’s impossible to guess what size nursing bra you’ll need (or your post surgical size) so something like this can be a lifesaver while you wait for a better option.